I finally had some time to post photos from my trip to Asia last January. I will have them all up eventually! I traveled to South Korea with two of my friends; a side trip after leaving Japan. Seoul was filled with shopping and more shopping. My friends and I purposely planned it that way so we did not get to see any historical attractions. 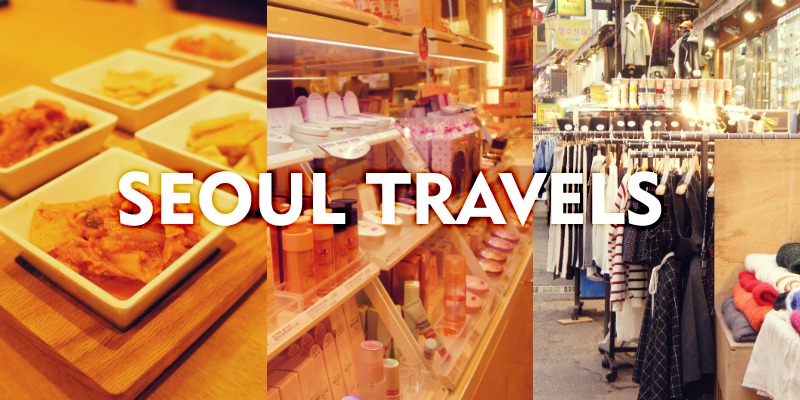 We mostly planned our trip to shop because Seoul has a lot of markets and they had a big sale going on. When we first arrived, it was already later and we were exhausted so we just grabbed something quick to eat for dinner and went straight to bed. In the morning, we had Paris Baguette for breakfast. The first shopping area we checked out was Namdaemun Market. They sold clothes, phone cases (I bought so many), bags, and more. There were several mainstream stores around such as the Body Shop, Zara, and so many beauty shops. There were also plenty of restaurants to choose from as well as street food. For lunch, we found a nice restaurant for lunch to eat kimchi and bulgogi. I do not remember the name because it is in English but you can see the Korean name below in the photos. Our next shopping area was Hongdae. They had just as many clothing, sovenir, beauty, and phone case stores except the crowd had a more youthful vibe. They had a Hello Kitty cafe around the block! We did not check it out though because we knew it would be expensive and we had just stopped at another cafe earlier. We also stumbled upon a craft store called Art Box which had so many cute things as well as heart capsules (like in A Millionaire's First Love *fangirl moment*). We returned to the hotel to eat and get dressed because we wanted to head back out to Hongdae to go clubbing. We ended up going to Club Vera because that was the first club we found and luckily got in for free by a sweet person in front of us while we waited in line. The club was very crowded, though it was a Friday night. There was a lot of laser lights and air shooting out from the sky. Most of the music the DJ played was electronic but we were hoping for more than that. Eventually we left and went back to our hotel. The next day my friends and I stopped by Itaewon because it was known to be a popular tourist shopping area. We did not stay long because we were not very interested in their shops. Their style was not as modern compared to the Myeong-Dong shopping area. Then we took the subway to the Gangnam Underground Shopping Arcade (Gangnam style!). It was endless but most of the shops sold similar items just at different prices. I snagged the most comfortable jacket though! There was also a food court where we bought bubble tea. Afterwards, we decided to head back to Namdaemun again because we liked their shops. On the way, I saw all these shoes being sold in the subway for just ₩5000 so I bought three pairs. Score! We had lunch at a restaurant called Yoogane where they served delicious fried rice in a large pan that was cooked in front of you. Later in the evening, we went to a cute little cafe, still in Namdaemun, for some hot chocolate and tiramisu. The food was delicious every place we went. On our last day before heading back home to the US, we ate Korean BBQ. So good! I wish I brought less clothes from home with me because I had to stop at some point since I had no more room in my luggage. All together I bought a couple of jumpers, skirts, shoes, and several phone cases. Seoul has cheaper hotel prices than compared to cities in Japan. The rooms are bigger too. → The capital city of South Korea. → Bus transportation is available right outside the airport that can take you to an airport bus stop by your hotel. Tickets must be purchased outside of the airport where the buses are stationed. One bus ticket was about $10 to the hotel I stayed at. → Booked a smoking, 3 single beds room with a balcony. They did not have non-smoking rooms available but fortunately the room did not smell like cigarettes. The room includes complimentary wifi, bathtub, toilet, air conditioning, refrigerator, television, direct-dial phone, hair dryer, safety deposit box, and coffee/tea maker. → Location is in the middle of a textile area but a 7-11, couple of cafes and food places are around the block. → Free bus shuttle at the entrance of the hotel. One bus heads to Myeong-Dong and another heads to DongDaeMun. The time schedule is available at the concierge. The buses can also take you back to your hotel. → About three blocks away from the closest subway stations (Chungmuro, Euljiro 3-ga, and Euljiro 4-ga). → Subway: Cheaper than taxi and runs til midnight. The ticket machines have English translations if you do not understand Korean so buying tickets is not too difficult. However, you will need a map so you know what subway to take and station to get off at. You can buy either a rechargeable card or a single ride ticket. Single tickets are about ₩900 and increase in the distance you need to travel. Make sure you do not throw out your subway ticket because you need it on your way out! Not like the US. You can also get a ₩500 won coin back at a deposit refund machine after you exit the ticket gate. → Taxis: They are color coded - regular taxi (white), deluxe taxi (black), and international taxi (yellow). The regular taxi is the cheapest however they charge more after midnight while the others do not. → A couple recommendations are: kalbi (ribs) bulgogi (barbecue), sundubu-jjigae (tofu stew soup), samgyeopsal (pork), jjajangmyeon (noodles), bibimbap (mixed rice), tteokbokki (rice cakes), japchae (noodles), seolleongtang (ox bone soup), haejang-guk (beef broth stew), street meat skewers, kimchi (spicy cabbage), twigim (fried vegetable or seafood), bingsu (shaved ice with sweet beans), and hodduk (sweet pancake with brown sugar syrup inside). → Street food and local restaurants are considerably cheap. → Restaurants can be cheap, moderately priced, or expensive. There are many restaurants within buildings so check out the signs by the entrance to see what restaurant is on each floor. → Alcoholic beverages can be bought at convenience stores such as 7-11 or liquor stores. → Club Vera (in Hongdae) plays electronic music, uses a lot of lighting and lasers, and has a lounge/bar/VIP section. → There is an entrance fee. → Coats and large bags must be checked into a duffel bag you can she with your friends for a small fee and retrieved when you leave. → You can check out other clubs as this was the only one I experienced. → There is a Korea Grand Sale that happens once a year (beginning of January to second week of February) where you can find items at discounted prices or promotional offers. Major shopping areas of Seoul take part in department stores and markets. → Markets are outdoors so make sure to bring an umbrella if it is raining and wear comfortable shoes. → Beauty products are the most popular items to buy so you will see many cosmetic stores like Etude House. → Many of the clothing only come in one size. → Love k-pop or k-dramas? Souvenir shops and stands are scattered in the markets and also at the Gangnam Underground shopping area. → You can bargain at the markets but if you bargain too low they will turn away. → Leave enough space in your luggage if you plan to shop (especially during the grand sale)! Tipping: Tipping is not required nor expected at hotels, restaurants, or taxis. A service charge may already be included in the bill. First stop for breakfast, of course! Happen to come at the perfect time of year for the grand sales all over Seoul! This was at Namdaemun Market. The busy streets of Seoul. I have been to Etude before but in the Philippines. Bought my first BB Cream here. Delicious! A lot of restaurant can be found in buildings several floors up. You can find large mainstream stores at the markets. I wanted everything (Hongdae Market). Hongdae Market at night. Also went clubbing at Club Vera! So many phone cases being sold! I bought several and everyone is selling for different prices. The cheapest I found was ₩ 5,000 KRW ($5 USD). However, it may have been because of the grand sale going on. Visited the touristy streets of Itaewon but did not stay for too long. Going to other markets may be worth more of your time. Checked out the Gangnam Underground Market. It is endless but most of the stores are similar. Large pan of rice at Yoogane in Namdaemun Market. The shopping scene in Namdaemun. There are other shopping areas too but I liked this market the best and Hongdae Market. So much good food being sold by the street vendors. Tiramisu at a cute little coffee shop the last night before the flight back home. Mel I am loving theseee! Makes me miss it so much!